Looking good Les. I have started doing some VCA tests on the single transistor VCA. It would be a very easy module build. But it is pretty noisy. May try to send you a sample audio of it tomorrow after work. Am about exhausted after work today. I have been toying with etching for a while. This would be a good first project to try it out on. If we had solder board versions mapped out and available for each module, that could be nice. What do you think? I really need to learn to use the computer to map boards anyway. Thank you for chiming in on this thread - yes, I am nothing if not clever! I have since figured (well, re-figured) out that I can get a "cold" soldering iron for this purpose. It is very safe. Still, this is worth doing if only for the exercise of doing it! I figure some customers will want this, and we can offer our flagship model, the VCO, in solder and non-solder versions. I should be ready to try my hand at etching VCO boards this weekend. Will document the method I came up with in a video. I have always wanted to see if I could make the best VCO possible from a UJT saw core. were things I always wanted to try. I have always had a soft spot in my heart for the UJT. My first early sound projects were built around it. If anyone sees obvious problems, please let me know. 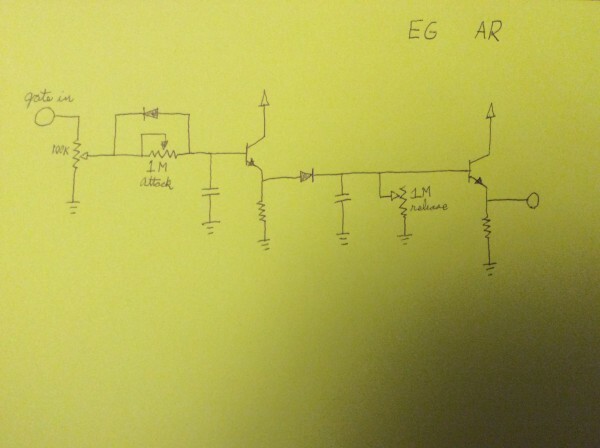 Ad a comparator and get PWM with the extra 2 opamps. Never tried PWM from a saw wave. I can't think of a reason that it wouldn't work ok. Shifting the comparator reference voltage would change the puls width. I have never seen anyone use a UJT core on a VCO of any quality. May be a good reason for that. May not. Just came to the realization that the little UJTs I like and the woman I loved both have a little saw shaped heartbeat. 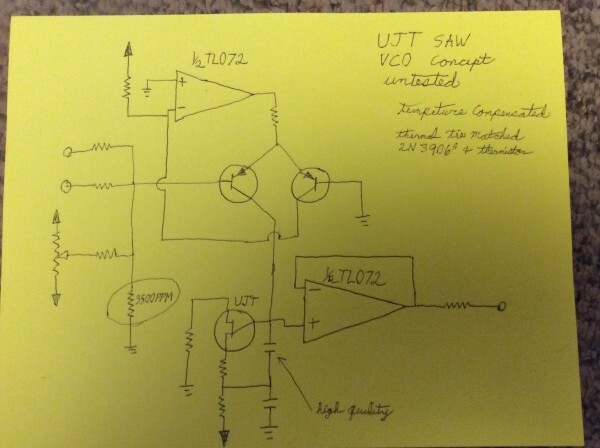 So I commented earlier about not seeing a vco schematic with good temperature compensation using a UJT core. Turns out there is a guy over on muffs working on one too. LOL what's the odds of 2 guys trying to perfect a vco using outdated UJT transistors at the same time? I don't feel so alone in the world. Are you comparing notes with him? No Les, I actually made a conscious decision not to read beyond the beginning of his poste. I would like to see where that section of working with the VCO design goes for me. Then compare end results with his end results. Will be interesting to see how similar the end results are. As they say, there is more than one way to skin a cat. I'm not a cat lover, so I prefer the straight forward get it done and ccck it method. LOL. So we got a functional envelope generator up and running that fits the current project profile. I'm sure someone has done it this way before, but I have never seen it. Will fill in final values once I'm done fine tuning.